Eher sonnig als wolkig. Kühl. Eher sonnig als wolkig. Mild. Eher wolkig als sonnig. Mild. Was tun Sie in Barcelona während Ihres Aufenthalts? Übersteigen Sie Auswahl, um online zu buchen. Bewundern Sie Gaudís erstes Meisterwerk! Besuchen Sie das FC Barcelona Stadion! 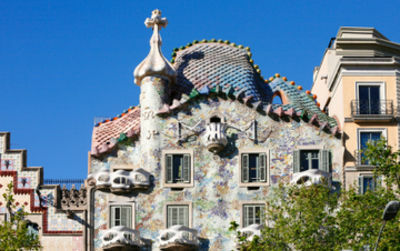 Die magische Welt der Casa Battló, die von Gaudi entworfen wurde. Diese sind die empfohlenen Sachen für IhreBarcelona-Feiertage. 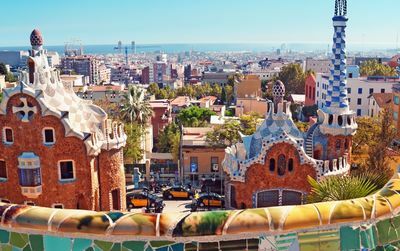 Der imposante und doch elegante Park Güell ist der Ausdruck von Gaudís genialer Vorstellungswelt im Großformat. Der über Barcelona thronende Park bietet üppige Gärten, skurrile Gebäude und unzählige fantastische Einzelheiten. Von der Eidechse am Eingang bis zur berühmten geschlängelten Bank: die Details werden Sie entzücken. 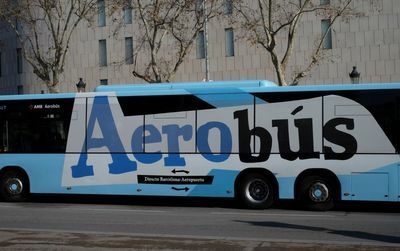 AEROBÚS ist der offizielle Bus Shuttle Service der den Flughafen BCN-EI Orat und das Zentrum von Barcelona verbindet, jeden Tag des Jahres in ca. 35 Minuten.Die Passagiere haben die Möglichkeit zwischen jedem der Flughafen Terminals zu reisen (T1 oder T2) und dem Zentrum von Barcelona (Pl. Catalunya) in nur drei Stopps in einem schnellen, komfortablen und ökonomischen Weg. 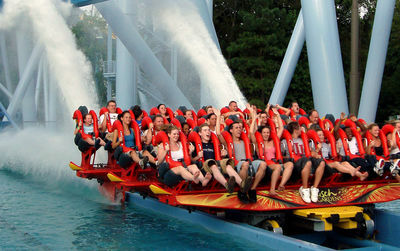 Der PortAventura Park bietet 40 Fahrgeschäfte, die das Herz eines jeden Adrenalinjunkies höher schlagen lassen. Entdecken Sie Angkor und gehen Sie an Bord für ein fantastisches Abenteuer im verlorenen Königreich, wagen Sie sich in die 8 schwindelerregenden Loopings des Dragon Khan, erleben Sie den freien Fall aus 100m im Hurakan Condor oder testen Sie Furius Baco, den schnellen Shuttle, der Sie in weniger als 3,5 Sekunden von 0 auf 135km/h beschleunigt. 17°.. cant' believe it.. I'm coming soon! plz i would like to come the end of march! !will be nice? I going to be in Barcelona in may , what will the weather be like? love this city when weather is nice like today..
coming soon glad to see that weather is really cool this week. 10° more than in my country. Hello all !!! What is the weather in Barcelona for the 7/8/9/10 feb 2013 ???? nice weekend to come again. great to go there. Glad to see the temps in Barcelona this coming week: 17,18, 17°.. goooood. thought it was going to be coolder: 19° is fine for me. coming for first visit but sadly dose'nt look very warm :( hopefully it dose'nt rain! 20°,21° a lot better than in many cities of Europe. This means you can wear t-shirt this week. Can you please help with expected weather from 6th to 20th November. Oh my God, only rain...I'm coming by rain! one great day today! yeah! I am off to Tossa De Mar on Sunday I'm hoping for some sunny weather ? a full week at 25°.. fine for me even it seems a bit cloudy. Great! Nous sommes allés à Barcelona du 8 au 16 septembre 2011, nous avons tellement adoré que nous y sommes retournés cette année pour la même période. Durant ces deux séjours, je n'ai jamais vu un seul nuage, toujours 32 degrés. C'est une ville absolument fantastique. Nous avons beaucoup voyagé, nous en avons vu des villes, Barcelona n'est peut-être pas la plus belle de toutes, mais de toutes, c'est celle qui a pris notre coeur pour toujours par tout ce qu'elle a à offrir. L'art, la plage, le magasinage, la température et les gens sont adorables. Il y a de l'ambiance dans cette ville-là, parce qu'il y a toujours du monde partout. C'est merveilleux.....Vous savez quoi, on rêve déjà d'y retourner. What is the weather forecast for next week in Barcelona please. I' M COMING FOR THE MERCE!!!!!!!!!!!!!. I THINK THE WEATHER WILL BE FINE!!!! Going to Barca for a week on Monday..hoping these forecasts or rain I've seen dotted about the web aren't true! I need some sun! I will come to Barcelona on 25 October how is the weather there???? And which place the best one in Barcelona???? to offer n other advise. We arrive on Sept 12th, what will be the weather forecast? Is it too cold to go for a swim in the sea? It's been hot and humid so far, great beach weather! Nous partons en famille à Barcelone du 17 au 24 août quel est la température et quel temps fera t-i?